The 6.0 Liter Vortec engine by General Motors is based on the small block V8 platform. This platform had a lot of variety, but the 6.0 L Vortec was primarily targeted for large trucks and SUVs, as opposed to the performance engines built on the same platform with similar or even larger displacements. The 6.0 L Vortec spanned across the Gen III and Gen IV small block V8 models. Primary changes to the Gen IV were block modifications to enable displacement on demand as well as designs to enable variable valve timing. The engine was offered in Cadillac Escalade, Chevrolet Avalanche, Express, Silverado, and Suburban, GMC Savana, Sierra, and Yukon, Hummer H2, and the Pontiac G8. The Gen III version of the 6.0 L Vortec was first introduced in 1999. The Gen III was available in two different RPOs, the LQ4 and the LQ9. The LQ4 was designed to provide great durability. The LQ9 is a very similar engine based on the LQ4, but it was developed specifically for the Cadillac Escalade, although this version was also added to certain GMC and Chevrolet full-size pickup models as well. One of the distinguishing features was the increased compression ratio for the LQ9, enabled by a different piston design. The first Gen IV version of the 6.0 L Vortec available in North America was introduced in 2007. The L76 essentially replaced the LQ9, and it offered the displacement on demand technology, as well as the variable cam phasing. This engine was eventually phased out in 2009. The LY6 was very similar to the L76, but primarily developed for heavy-duty trucks, and the LY6 is still an option for these heavy duty pickups. This engine was very popular for its power and towing ability, particularly for a gasoline engine, as well as its durability. The major negative comment for most owners was related to fuel consumption associated with this engine. The Gen III LQ4 engine was capable of achieving 300 horsepower at 4400 RPM and 360 lb-ft at 4000 RPM, while the LQ9 was rated at 345 hp at 5200 RPM and 380 lb-ft of torque at 4000 RPM. The Gen IV model L76 had rated horsepower of 367 at 5400 RPM and peak torque of 375 lb-ft at 4400 RPM. Both the Gen III and Gen IV 6.0 L Vortec engines had identical displacement of 5.967 L, or 364.1 cubic inches. These engines had a bore of 4.0 inches with a stroke of 3.62 inches. A couple of model years of the Gen III engine used cast iron head, but after that the engine switched to aluminum alloy cylinder head. The Gen III block was constructed from cast iron for the entirety of its availability. The L76 was the Gen IV RPO and aluminum cylinder head and block was used. The LY6, which was a very similar engine but used in the heavier duty applications, used a cast iron block. Both engines used traditional overhead valve (OHV) design with 2 valves per cylinder, driven by a traditional camshaft in block design. The 6.0L Vortec engine was first introduced in 1999, and some version of that engine is still present today. This engine is well known for having plenty of power and providing good performance in heavy load, but it is also known for its high fuel consumption. 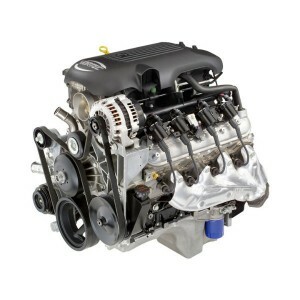 Overall, customers are generally happy with the performance and durability of this engine.